AMDA (9-Aminomethyl-9,10-dihydroanthracene) is an antagonist for the 5-HT2A receptor. It has been used to help study the shape of the 5-HT2A protein, and develop a large family of related derivatives with even higher potency and selectivity. ^ Westkaemper, RB; Runyon, SP; Bondarev, ML; Savage, JE; Roth, BL; Glennon, RA (1999). 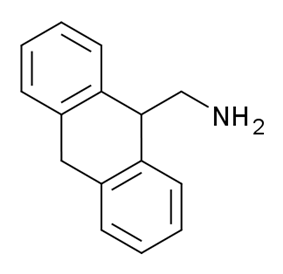 "9-(Aminomethyl)-9,10-dihydroanthracene is a novel and unlikely 5-HT2A receptor antagonist". European Journal of Pharmacology 380 (1): R5–7. ^ Runyon, SP; Peddi, S; Savage, JE; Roth, BL; Glennon, RA; Westkaemper, RB (2002). "Geometry-affinity relationships of the selective serotonin receptor ligand 9-(aminomethyl)-9,10-dihydroanthracene". Journal of Medical Chemistry 45 (8): 1656–64. ^ Peddi, S; Roth, BL; Glennon, RA; Westkaemper, RB (2003). "Spiro9,10-dihydroanthracene-9,3'-pyrrolidine-a structurally unique tetracyclic 5-HT2A receptor antagonist". European Journal of Pharmacology 482 (1–3): 335–7. ^ Peddi, S; Roth, BL; Glennon, RA; Westkaemper, RB (2004). "Structural determinants for high 5-HT(2A) receptor affinity of spiro9,10-dihydroanthracene-9,3(')-pyrrolidine (SpAMDA)". Bioorganic & Medicinal Chemistry Letters 14 (9): 2279–83. ^ Dewkar, GK; Peddi, S; Mosier, PD; Roth, BL; Westkaemper, RB (2008). "Methoxy-substituted 9-Aminomethyl-9,10-dihydroanthracene (AMDA) Derivatives Exhibit Differential Binding Affinities at the 5-HT2A Receptor". Bioorganic & Medicinal Chemistry Letters 18 (19): 5268–71. ^ Runyon, SP; Mosier, PD; Roth, BL; Glennon, RA; Westkaemper, RB (2008). "Potential Modes of Interaction of 9-Aminomethyl-9,10-dihydroanthracene (AMDA) Derivatives with the 5-HT2A Receptor: A Ligand Structure-Affinity Relationship, Receptor Mutagenesis and Receptor Modeling Investigation". Journal of Medical Chemistry 51 (21): 6808–28. ^ Shah JR, Mosier PD, Peddi S, Roth BL, Westkaemper RB (February 2010). "9-Aminomethyl-9,10-dihydroanthracene (AMDA) analogs as structural probes for steric tolerance in 5-HT2A and H1 receptor binding sites". Bioorganic & Medicinal Chemistry Letters 20 (3): 935–8.